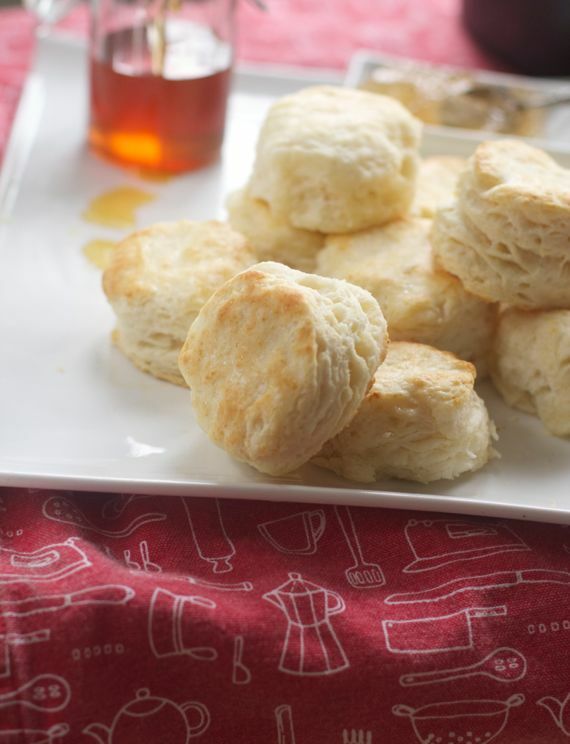 Fluffy, melt-in-your-mouth biscuits. Great with dinner with butter and jam. For variations, try sausage and biscuits; fold in 1/2 cup shredded cheddar cheese and 1 tsp California garlic powder; or top with chocolate sauce for a fun dessert. Cut butter into flour with pastry cutter. Put the flour and butter mixture into freezer for 15 minutes. Add a pinch of baking soda to the buttermilk. Remove flour from freezer. Add buttermilk; stir. Mixture will be wet. Flour the counter or mat. Flour hands and form dough into a ball. Knead no more than 8-10 times with hands. Less is best. Pat down to 1 1/2" thickness. Using a biscuit cutter, cut biscuits with up and down method. Do not twist. To make substitute buttermilk: Pour 2 teaspoons white vinegar into measuring cup. Fill cup with whole milk up to 3/4 cup. Let sit until milk thickens.